is a natural formula that is environmentally friendly and biodegradable, with no formaldehyde. It is safe, clean, easy to use and not chemically sensitive. Happy Campers Treatment liquifies waste . . . and household tissue is O.K.! And it is POWERFUL . . . 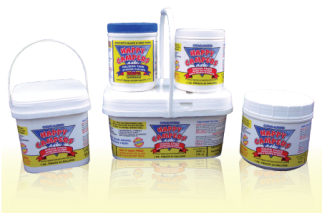 Happy Campers is the lowest cost product on the market today - do your math! most economical, first class treatment available. So, why should you consider Happy Campers Treatment? Now... compare Happy Campers Treatment with anything else available. Then... compare the price and you will see why time and time again the smart campers must have Happy Campers. After a trial period of one season of your product even during periods of record breaking 117 degree heat, we had no complaints of toilet odors. Thank you for providing such a reliable product. Happy Campers just developed a product that will take care of all of these problems! We call it Extreme Cleaner& it is designed to clean & remove all types of waste, tissue, soap, & scum buildup from both black & gray tanks. It comes in an 18oz. Container & like our other products your satisfaction is 100% guaranteed!